This festival, now in its fifth year, will take place at the end of June to celebrate Chester’s heritage and to tell the story of our city and its people. Over 60 events will put the spotlight on Chester’s 2000-year history and heritage. Whether resident or visitor, young or old, we hope you will find something of interest and come and see how the rich tapestry of our city’s past frames its present and will benefit its future. The events take place all around Chester: on the streets, along the waterways and in historic buildings. Walks, talks, performances, exhibitions and storytelling are included in the programme and the festival again coincides with the Midsummer Watch Parades, on 22nd and 23rd of June. 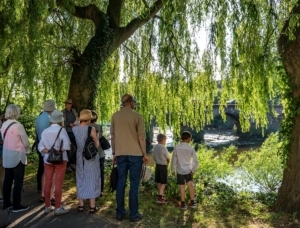 The festival is co-ordinated by Chester Civic Trust and Cheshire West and Chester Council, in close collaboration with many other groups such as the Guild of Tour Guides, Chester Race Company, the Grosvenor Museum, Storyhouse and Marketing Cheshire. The festival programme will be launched on 25 May at Chester Races’Roman Day. Expect much pomp and lots of activities to make this a fun day and an opportunity to celebrate 480 years of racing on the Roodee. Learn more about the history of the Roodee during a racecourse tour at the start of the festival on 21st June. Join us for an evening cruising on the Dee to bring the festival to a close on 29thJune. Full details of these and all other events will be published on www.visitcheshire.com/chesterheritagefestivaland in a booklet available from Saturday 25 May. Meanwhile please follow us on Twitter @Chesterherifest.